Bringing back memories of the Hollywood of yesterday, the beautiful Echo Lake is surrounded by Hollywood landmarks of a long-lost time. 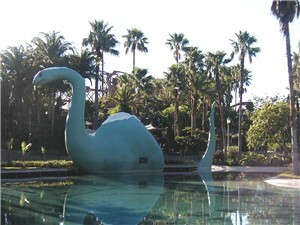 Echo lake is home to one attraction and two and a very popular stage shows, based on Star Wars and Indiana Jones. In addition, here you will find the Academy of Television Arts and Sciences Hall of Fame. In this outdoor exhibit, guests will find bronze busts of some of their favorite television stars. Honorees in the plaza are all Hall of Fame inductees. Founded in 1946, the Hall of Fame recognizes and honors outstanding contributions to the television medium. Guests may wander this open air plaza and pose for pictures with some very well known stars. Jedi Training: Trials of the Temple NEW! Star Wars: Path of the Jedi NEW!